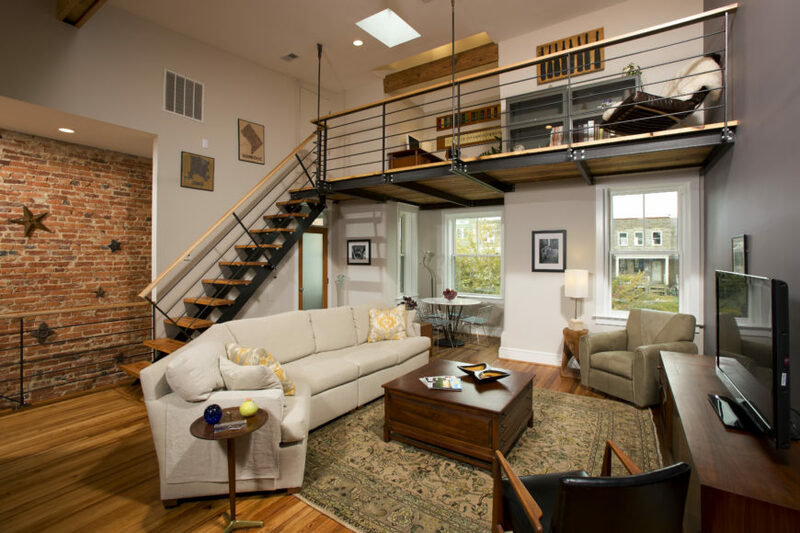 Welcome to our gallery featuring a chic Washington D.C. condo conversion by Four Brothers, LLC. Four Brothers is indeed founded by four brothers: the Johnson brothers. The brothers were raised in a collective commune, and all four completed extensive woodworking apprenticeships before graduating high school. 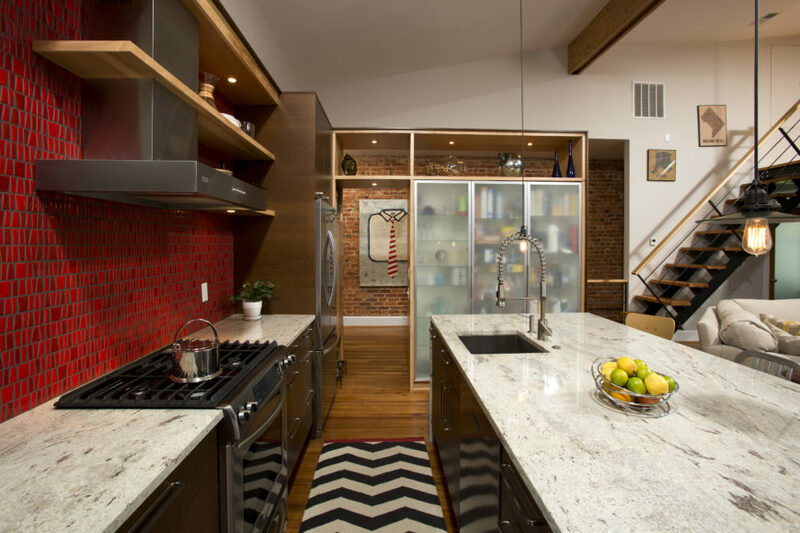 Although Four Brothers originally were carpenters, the firm has quickly risen to become one of Washington D.C.’s highest rated and respected design companies. 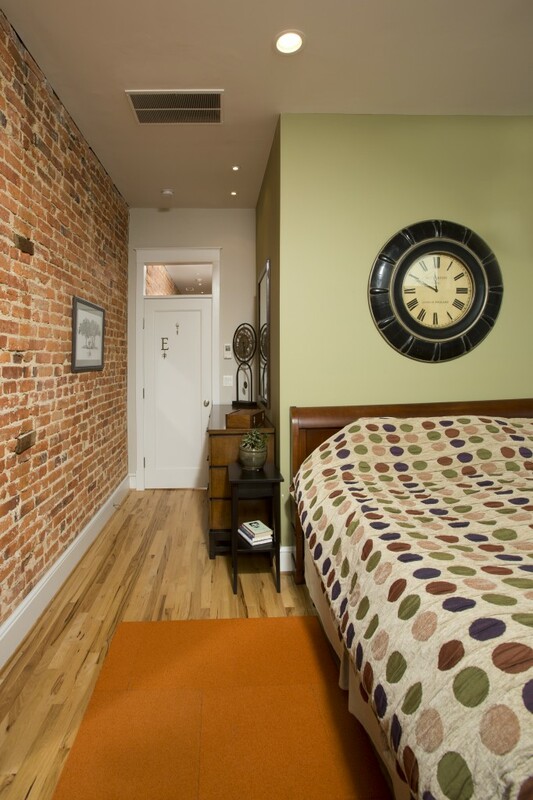 The condo conversion project began with a building over 100 years old, in poor shape. The construction had not aged well. 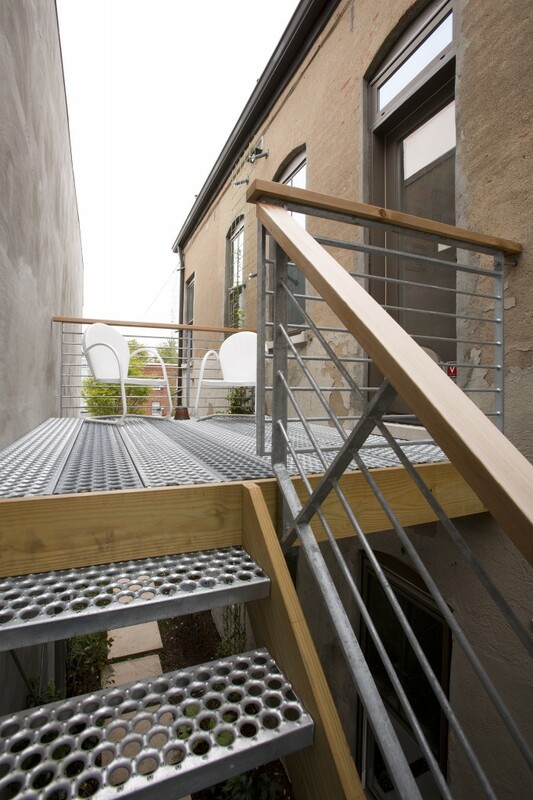 The owner purchased the property with plans to create two separate two-level condos. This gallery focuses on the first; a second part will focus on the other condo. 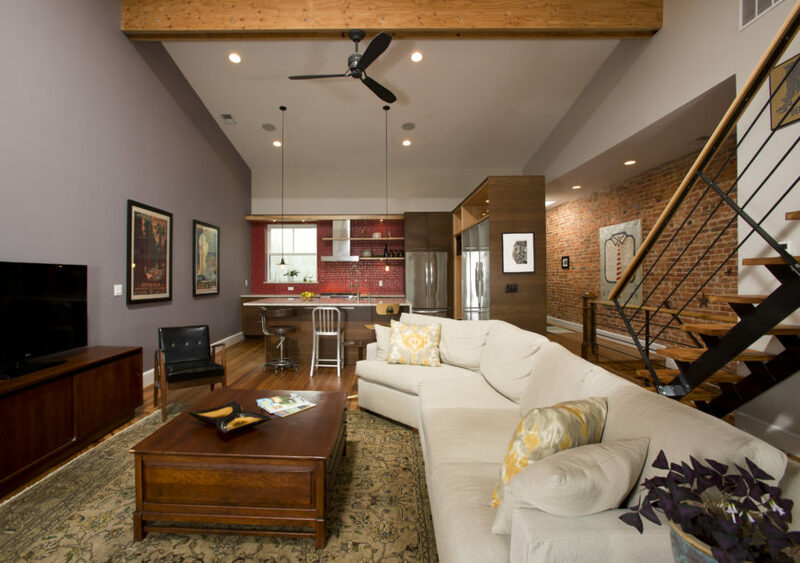 The design goal for these condos was to maximize lighting on both floors, and to restore some of the original features while still keeping an industrial and clean design. 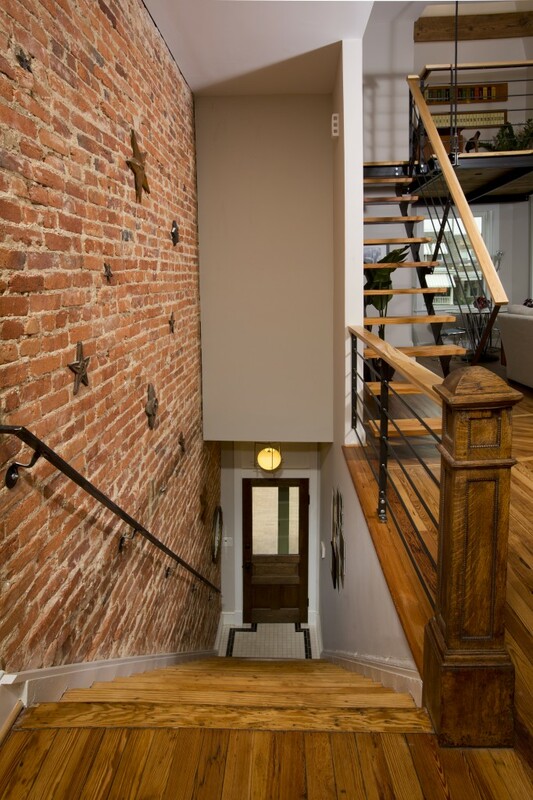 These goals were, in some cases, achieved by keeping the original flooring when possible, or stripping away paneling to reveal the original brick. See the renovation of the other unit here (part 2). We hope you enjoy the first part of this two-part gallery. 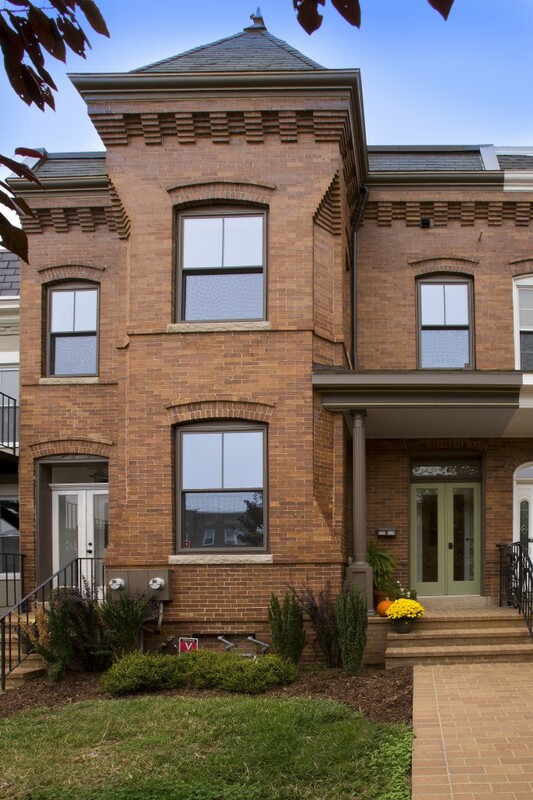 Exterior and front walkway of the Columbia Heights Condo. 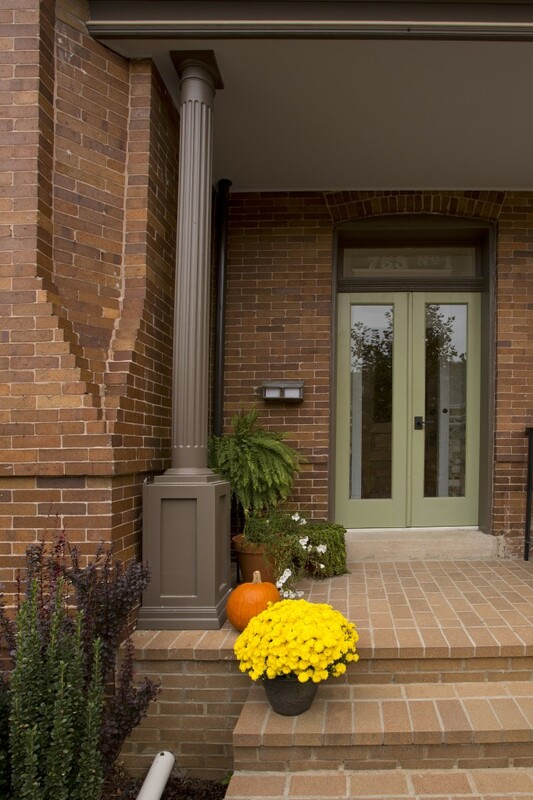 The warm stone steps up to the condos are decorated with bright fall flowers and other plants. 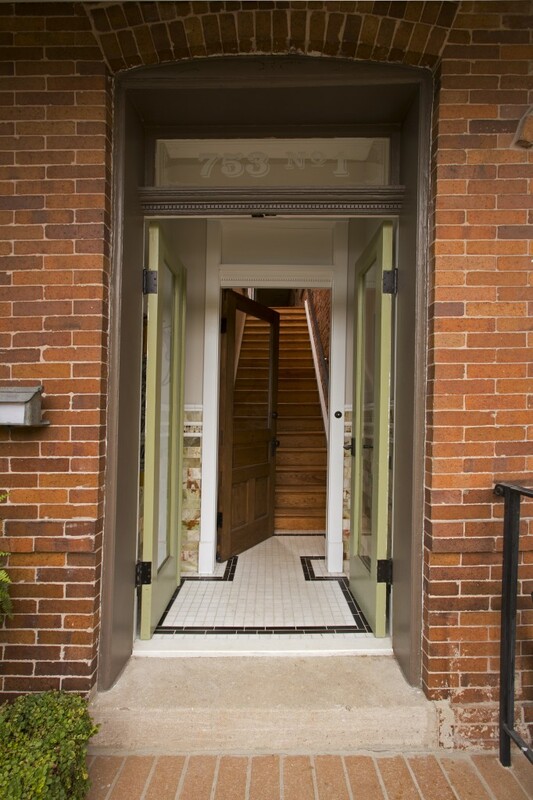 The green double doors lead into the main hardwood staircase to the first of the two condos. The original pine-heart floors were salvaged, saving both money and original charm. The original brick wall is also exposed on the staircase. 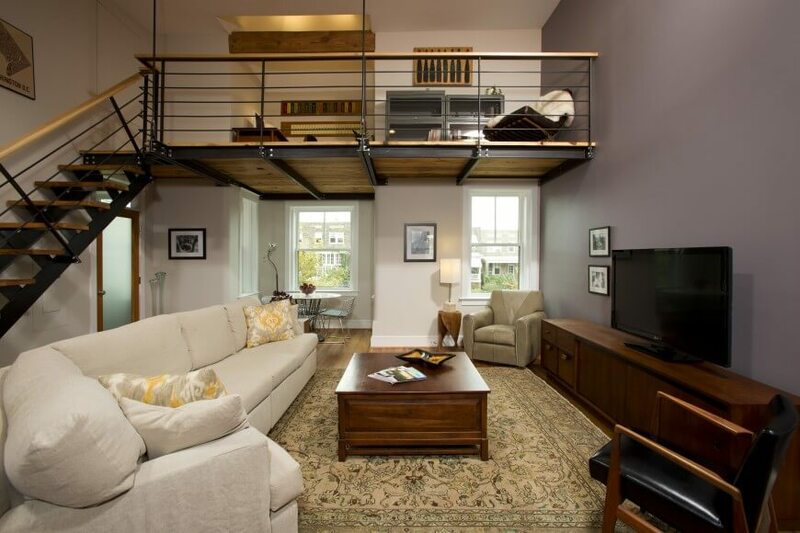 The main living area is open-concept with an open loft. The long white sectional sofa is matched with a beige armchair and a black leather chair. The dark wood coffee table matches the smooth lines and color of the wood media center. From the opposite side of the room, we can see that the open concept main floor includes an eat-in kitchen. 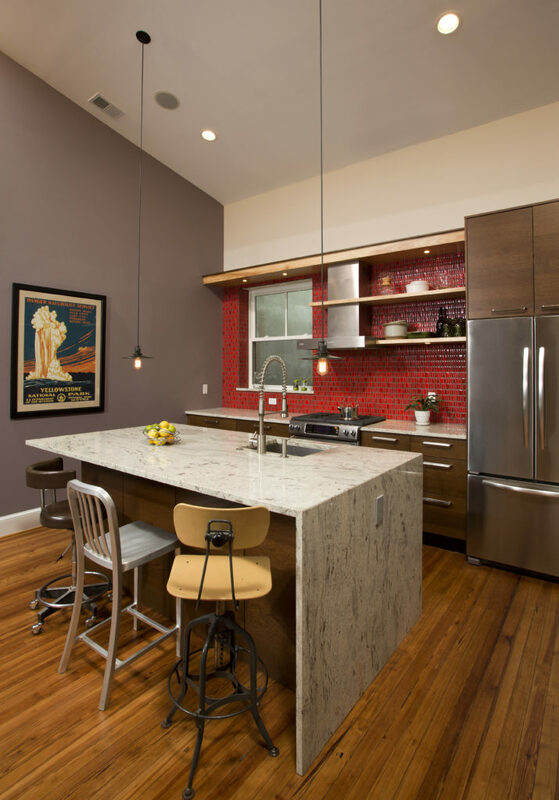 Three mismatched barstools sit at the granite bar of the kitchen island. The chrome fixtures and stainless-steel appliances. 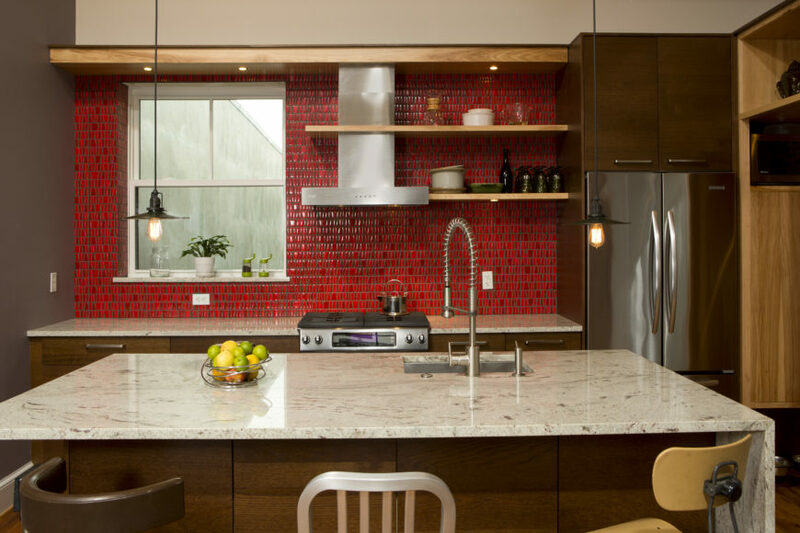 The backsplash is a bright, glossy red. A single window in the kitchen area peeks out over the backyard. The cabinets are budget-savers; bought from IKEA, they show that even a small budget can have great design. A chic chevron rug lays in front of the stove. This side of the island has more storage and a dishwasher. On the far side, the hallway is blocked off with a simple shelving unit. On the side facing the kitchen is frosted glass. 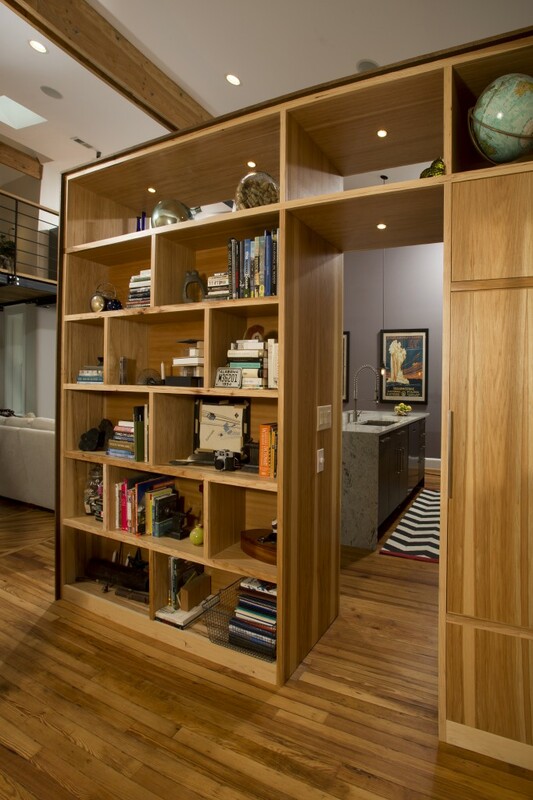 The opposite side of the shelving unit is a large bookcase with many different sized cubbies. The shelving is made out of pine similar to the original flooring. A close-up of the small, more formal dining area, enclosed in a small alcove with windows on each side. 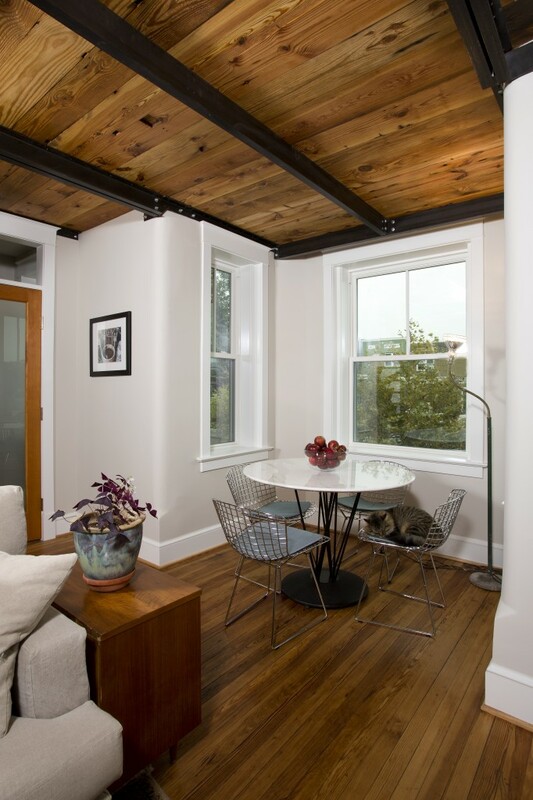 To give the room a more industrial feel, black metal beams are exposed on the ceiling below the loft. 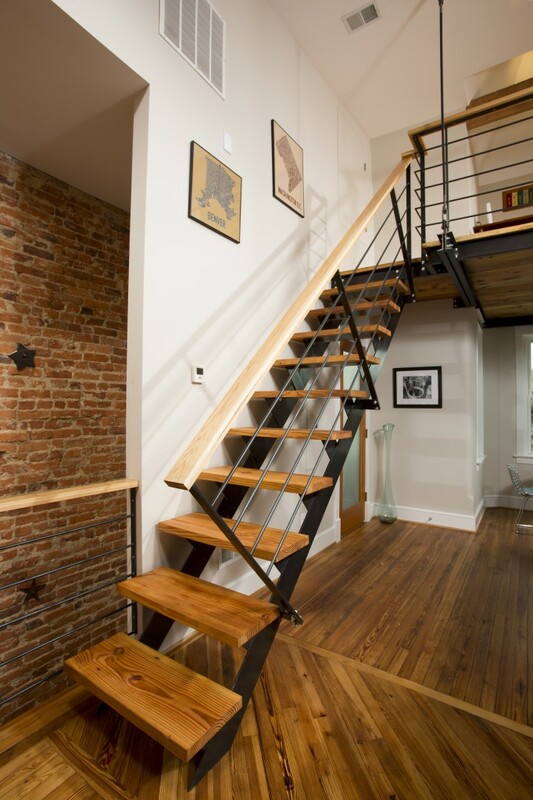 The frame of the open staircase going up to the loft keeps the space feeling open. Pine footrests match the wood throughout the condo. 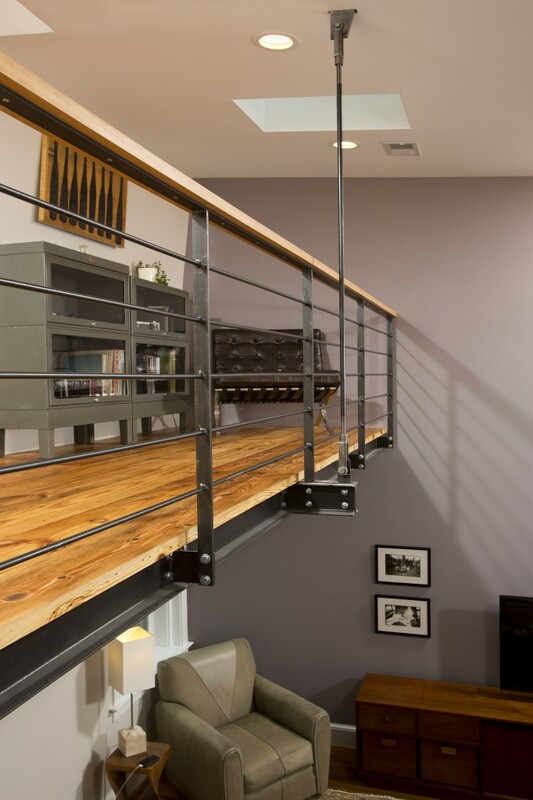 The loft consists of a small seating area with a couch and a small home office. A small square skylight adds more natural light. This cool blue and white bathroom has a large soaking tub and shower enclosure on one wall, and a pedestal sink next to the door. 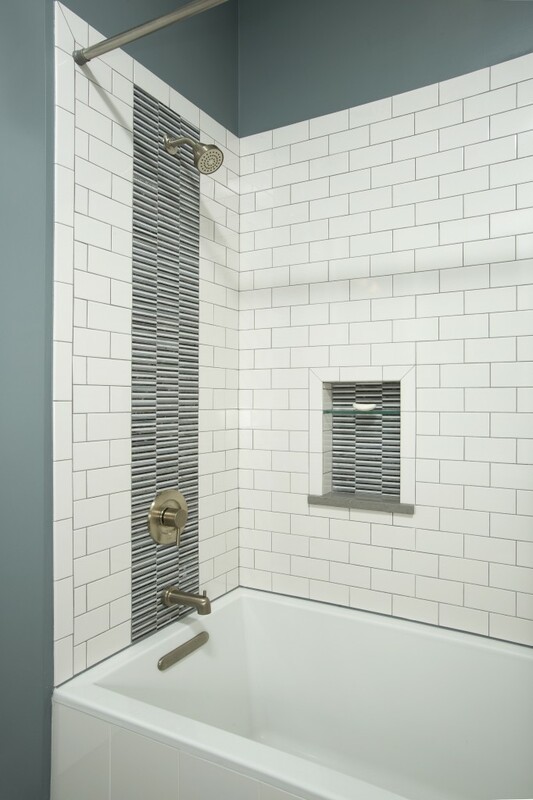 A closer look at the bathtub and shower enclosure shows white subway tiles broked up by black and gray striped tile. 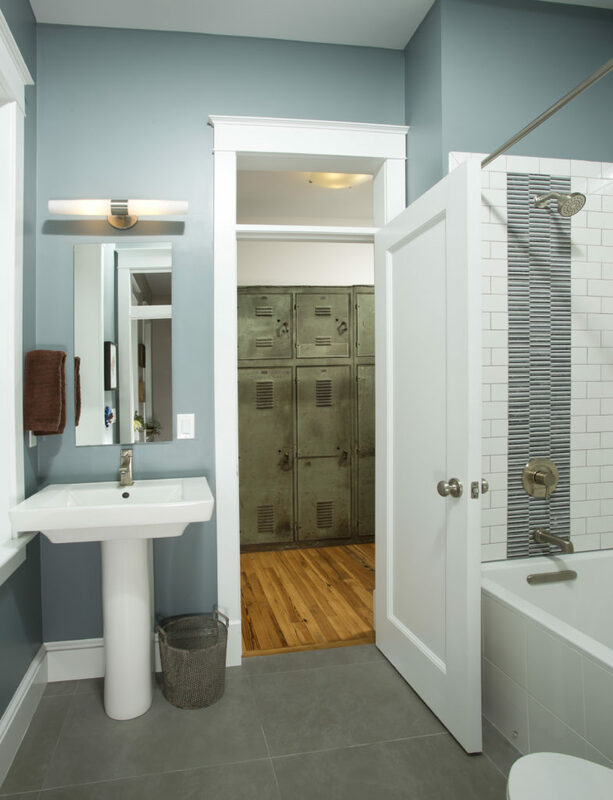 The fixtures are brushed nickel. 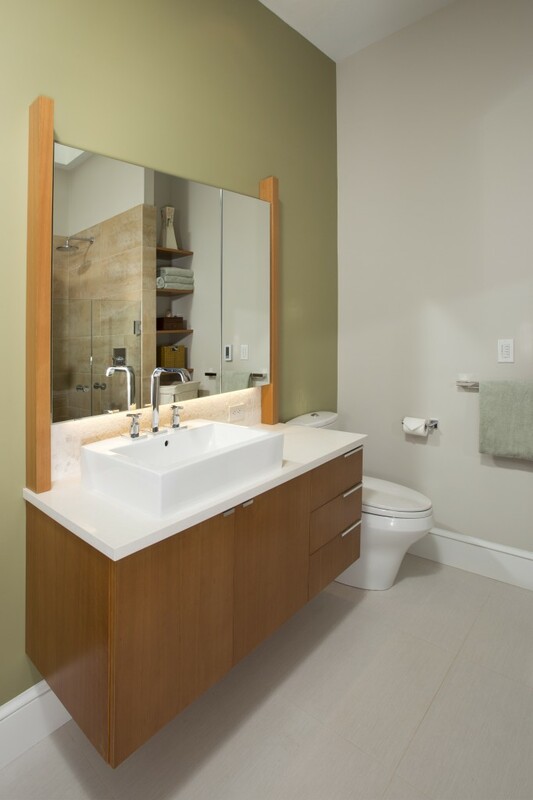 The other bathroom has a natural wood vanity with minimalist drawer pulls. A large white vessel sink melds into the countertops. 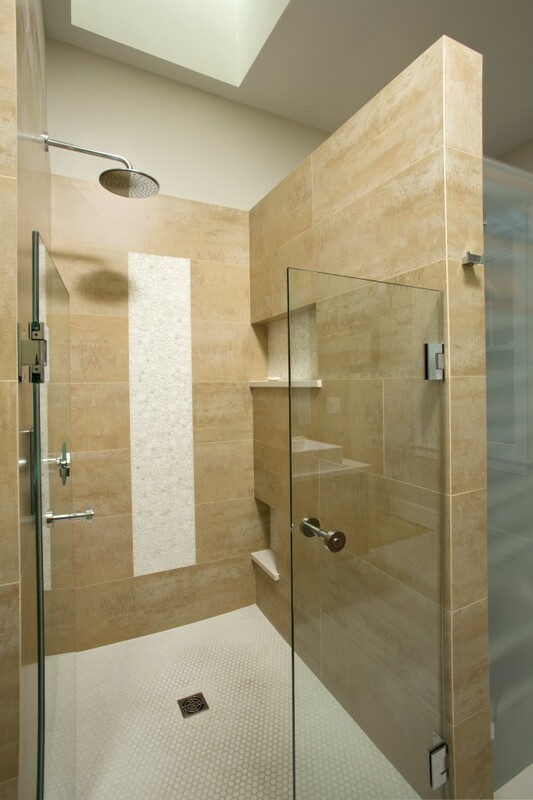 The glass-enclosed shower stall is lined with white tile and natural stone. The roomy stall has built-in cubbies. 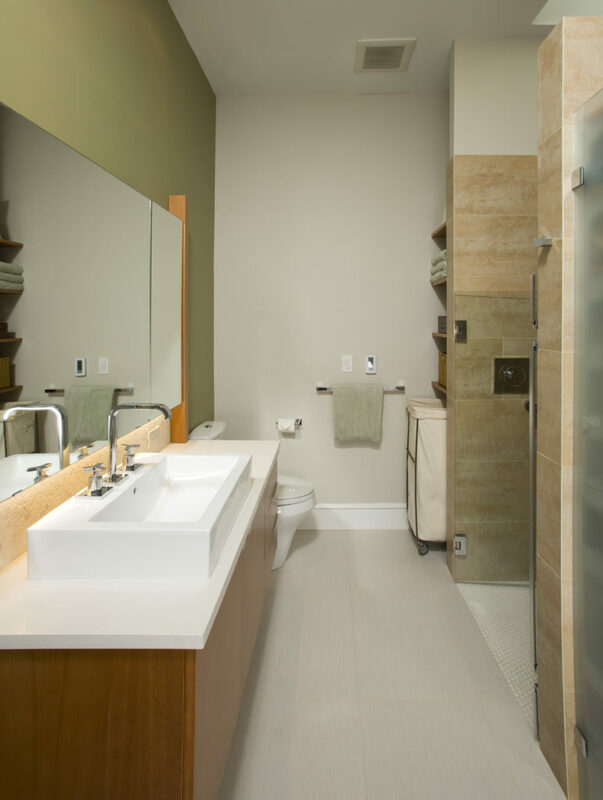 A long view of the bathroom shows a small built-in shelving unit with a laundry hamper beneath it to one side of the shower stall. 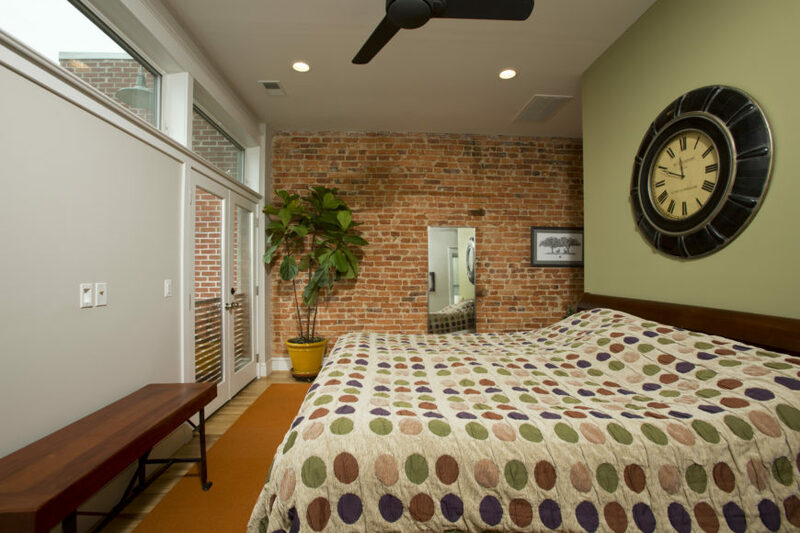 The bedroom displays much of the original features, including the pine flooring and brick wall. The rest of the room is in beige, brown and greens, with dark wood furniture. Double glass doors lead out on to a small balcony from the master bedroom. Recessed lighting and long windows ensure the room is well lighted day and night. 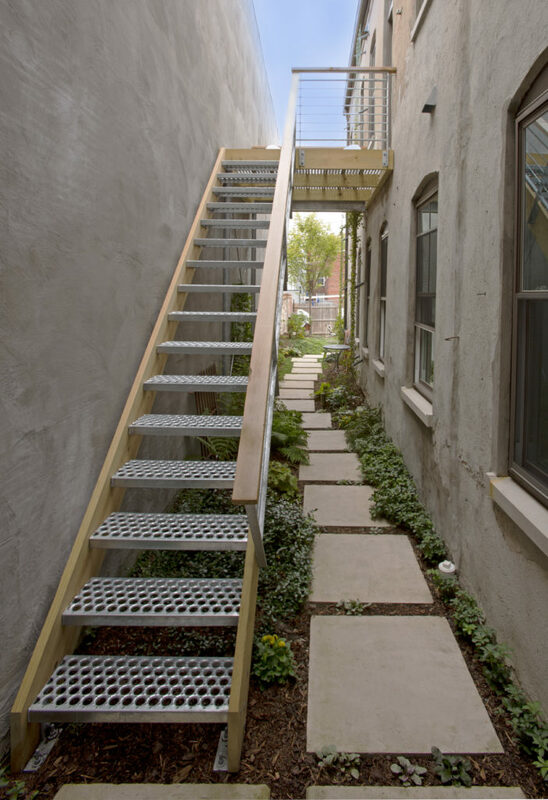 A landing coming off the back of the unit employs industrial-style stairs down to a garden walkway to the backyard. 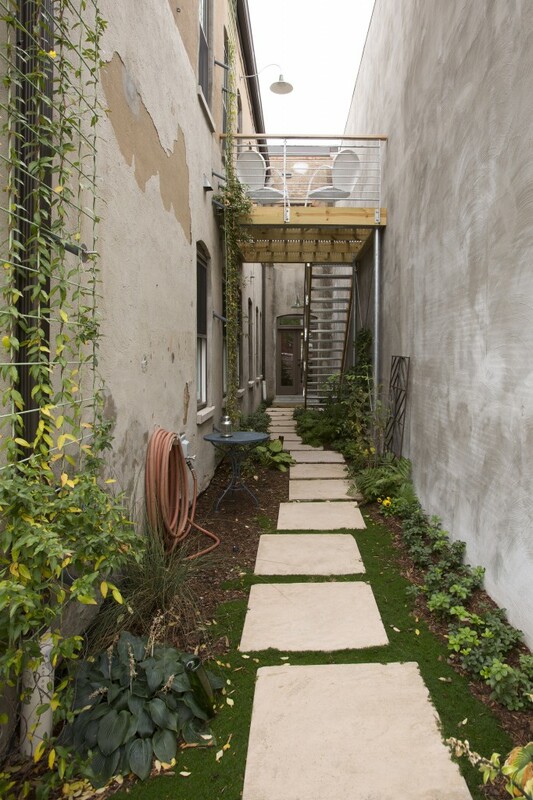 At the foot of the stairs, a stone and bark path, lined with small, easy to care for plants, leads into the backyard. A view from the backyard shows the doorway at the opposite side that leads to the ground level. 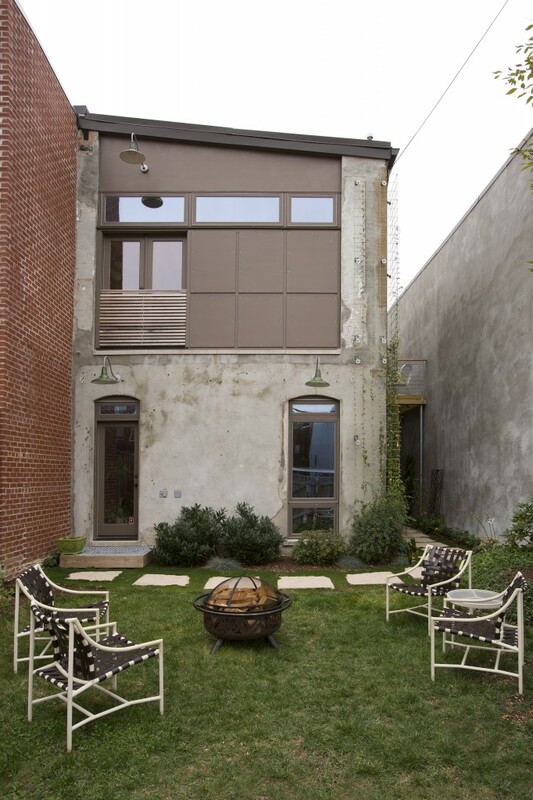 The small backyard has a metal firepit and several lawn chairs. The stone path leads around the back to another door. The outside of the building is concrete.